(Bloomberg) -- If stock-pickers are becoming an endangered species, this may be the latest sign. Investors now have more money in large-cap equity funds tracking indexes than in actively run funds of the same type. The lines crossed in the fourth quarter, according to data from Morningstar Inc. 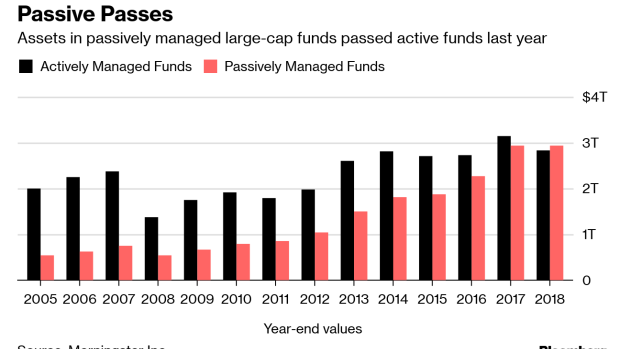 Passive mutual funds, exchange-traded funds and so-called smart beta funds in the sector held $2.93 trillion in assets as of Dec. 31, compared with $2.84 trillion on the active side. The gap has been narrowing for years as investors pour money into low-fee index funds while higher-cost stock-pickers struggle to consistently beat markets. Based on the flow trends, passive funds tracking U.S. stocks of all sizes could pass up their active rivals this year. Only 24 percent of all active funds -- those holding stocks, bonds or real estate -- outperformed their average passive rival over the 10 years through December, according to a Morningstar analysis of 4,600 U.S. funds with $12.8 trillion. Long-term success rates were generally higher among foreign-stock funds and bond funds and lowest among U.S. large-cap funds, the report by Ben Johnson and Adam McCullough found. Despite the change in dominance, passive funds are far from controlling the overall stock market. The market capitalization of the Russell 1000 Index is about $26.7 trillion, according to data compiled by Bloomberg.